XmlRootElement – This is added to the class and will map the class to the XML. XmlElement – This used to methods or property and will map the property to an XML element. 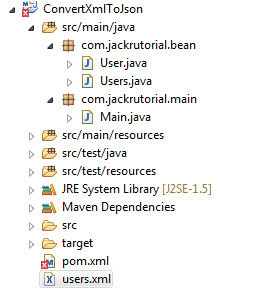 Create a User class under com.jackrutorial.bean package and write the following code in it. Create a Users class under com.jackrutorial.bean package and write the following code in it. Create a Main class under com.jackrutorial.main package and write the following code in it. 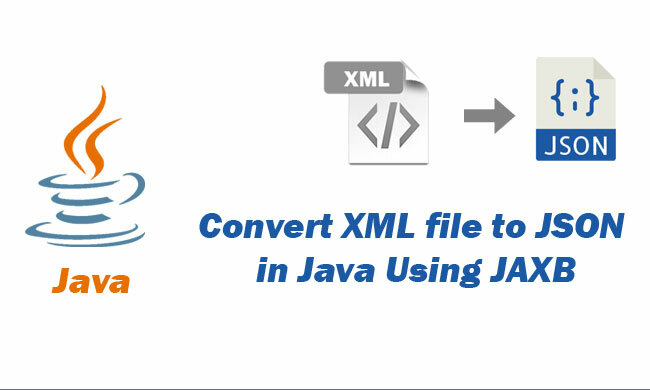 First, we will convert a users.xml file content into a users object using JAXB unmarshalling. Then we will convert Java Object to Json using Google Gson data binding API Gson.